Mobile technology has become an essential tool for first responders. However, mobile technology may also come with its own set of challenges including adoption which is still in its infancy. The emergence of first responder broadband networks introduces new ways to respond to incidents. Devices worn by first responders, or placed on victims during triage, can transmit voice, along with two-way video and data streams, including location, vital signs and environmental conditions, allowing unprecedented incident management capability. First responders are starting to use wearable devices, such as sensors embedded in firefighter suits, and head-mounted cameras and heads-up displays used in law enforcement. Accessing and integrating information from various sources is critical for situational awareness during emergencies. The variety of data sources, including cell phones, mobile devices, cameras and deployed sensors, grows daily, but typically these devices and sources do not interoperate with each other natively or with existing mobile radio networks. Thus, interoperability and integration between heterogeneous devices and networks is a challenge for effective emergency response. Zotera's Industrial Internet of Things (IIoT) solutions are designed to integrate and exchange data from a variety of devices, and sensor types, including physiological monitors, vehicle geospatial position trackers, mobile video cameras, laser rangefinders, cell phones, and others. Officers can now receive relevant information in route to a call-individuals involved, previous calls at the address, even real-time video surveillance feeds to better assess and respond. 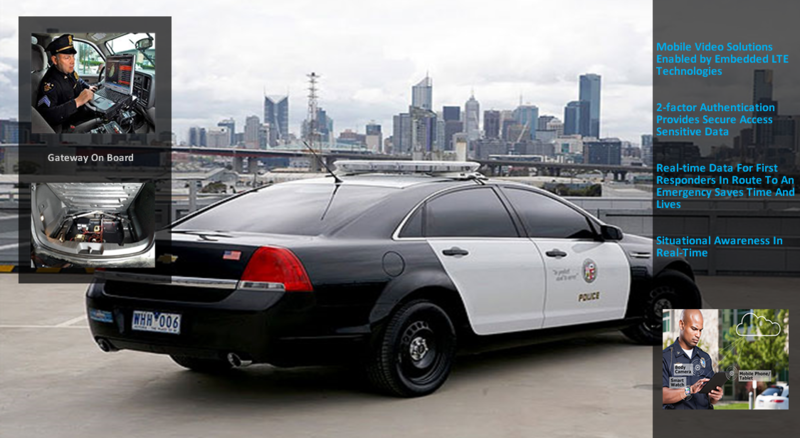 Connected police vehicles keep officers linked to state and federal criminal databases, police and courthouse applications, license plate recognition systems and much more. Police departments can use sensors that report when a police officer draws his or her a gun, resulting in an immediate call for backup assistance. With police shootings in the national spotlight, any extra information can help save lives and simplify investigations. Some cities are already using sound sensors to determine when and where civilians fire unexpected gun shots in order to protect the public and officers. Paramedics can securely access electronic patient care records to understand a patient's medical history and conditions when responding to an emergency. They can transmit vital signs from the field, and communicate back to hospitals for guidance or to prep emergency services-all of which can shave critical minutes off response times, and save lives. Few organizations will benefit from IoT more than fire departments. 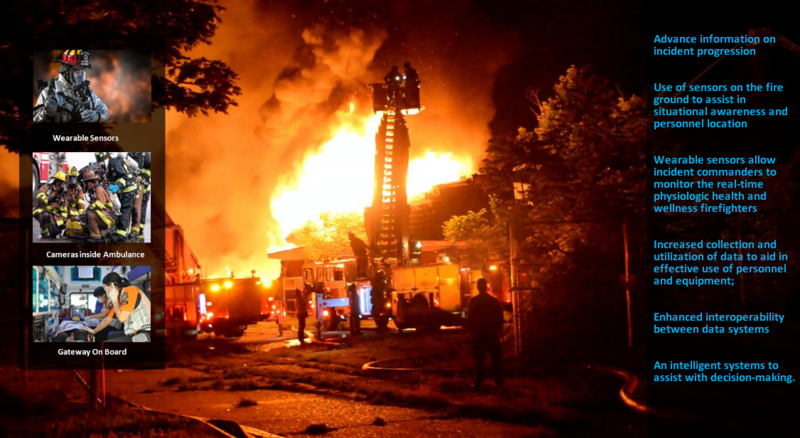 Fire departments can improve their response thanks to sensors and databases providing advance information on the progression of fires, number of building occupants, and floor plans. Firefighters can access extensive information from the vehicle when responding to fires. They can identify sites with hazardous materials and access building plans to determine the best method of access, and better protect emergency personnel and citizens. New sensors are also making the jobs safer for firefighters. New smart clothing, armed with sensors, reports the vital signs and temperature of firefighters in dangerous situations. This information helps firefighters decide when to retreat or alerts a rescue team that a firefighter is in trouble.